Dainty Diana - The Diana Baby 110 is super small, perfect for bringing along wherever you go. With this baby by your side, you can take beautiful photos that are absolutely mind-blowing! Easy Shooting - With limited switches, you can focus on taking great shots instead of spending a lot of time fiddling with controls. Interchangeable Lenses - The Diana Baby 110 Camera and Lens Package includes two lenses for you to choose from. The 24mm lens produces standard square shots and the 12mm lens yields wide-angle square photos. Multiple and Long Exposure Capabilities - Create stunning multiple exposures by overlapping shots without advancing your film or shoot amazing night-time or low-light photos with the Bulb mode! Flash Compatibility - Attach a PC Flash Adaptor to the Diana Baby 110 and enjoy bursts of bright light on your shots! 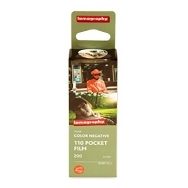 110 Film - Lomography has brought this format back from the dead. Load your Diana Baby 110 with fresh Lomography 110 film.